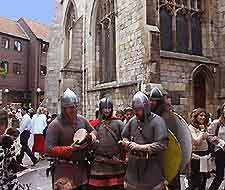 The Viking city of York is one of north-England's most compelling cities and is home to a wealth of culture and history. 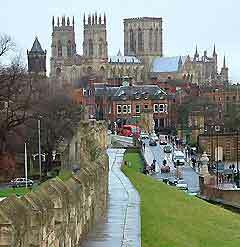 York's narrow, medieval streets are surrounded by the 13th-century City Walls. At the heart of the city centre lies the magnificent York Minster, with immense architecture and spectacular gardens nearby. The city is understandably popular with tourists and during the summer months it at its most appealing - and busiest. A maze of streets lie in the centre of York, where they are lined with medieval shopfronts, traditional pubs and street entertainers, who will often paint your portrait for just a few pounds. The main Tourist Information Centre (TIC) in York is to be found at the De Grey Rooms on Exhibition Square, on the northern side of the River Ouse, close to Bootham Bar, while a smaller tourism outlet resides at the city's palatial railway station. York is a particularly attractive city and the River Ouse winds its way through the city centre, adding much character and crossed by a number of beautiful old bridges. Some of the most popular tourist attractions in York include the Jorvik Viking Centre - where you can explore the city's rich Viking history; the York Maze - the largest seasonal maze in the United Kingdom, created from around 1.5 million maize plants; the York Dungeons - filled with animated waxworks and realistic, gory displays; the Observatory - built in the early 19th century, with large, powerful telescope and an interesting exhibition; the Shambles - one of the most well-known areas in the city, with medieval-cobblestone streets; and the Grand Opera House - hosting a large number of important national and international productions each year. Other attractions in York include Fairfax House - a stunning 18th-century house recently voted the best Georgian Townhouse in the whole of England; Castle Howard - a magnificent 18th-century mansion with breathtaking grounds; the Treasurer's House - an impressive medieval hall; Monk Bar - one of the four medieval gatehouses that form part of the City Walls; the Roman Column - the only remaining column of 36 that once supported a grand Roman hall; York Railway Station - once the largest train station in Europe; and Clifford's Tower - an impressive tower that was originally built more than 1,000 years ago, providing some of the most spectacular, panoramic views of this North Yorkshire cityscape. 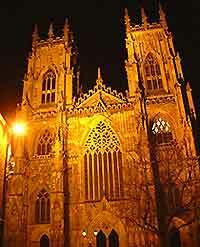 More information about York Tourist Attractions and York Landmarks. Attractions for children in the York area include the exciting Flamingo Land Theme Park and Zoo - with numerous, thrilling roller coasters, fast rides, cafés, picnic areas, playgrounds and one of the biggest zoos in the area; Water World - with two swimming pools, a wave machine, water slides and an area for younger children; the Lightwater Valley Family Theme Park - with many fast and exciting rides, including one of the longest roller coasters in the world; and the York Model Railway - next to the train station, with impressive fully-landscaped miniature railways. 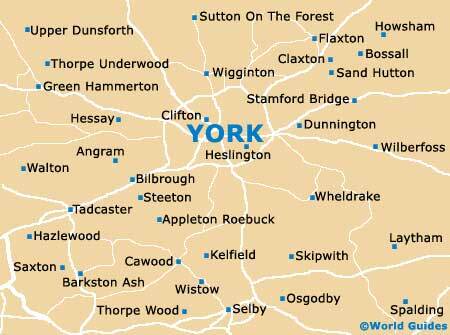 York has many green areas of parks and gardens, providing peaceful areas in the heart of city life. These include Burnby Hall Gardens - a spectacular, landscaped garden, with Victorian-style planting, rock gardens and a bandstand; Clarence Gardens - full of colourful flower beds, large open-expanses of lawn, mature trees, manicured-bowling greens and an exceptional playground area for children; Sutton Park - award-winning gardens with enormous flowerbeds, pathways, nature trails, lush planting schemes, and a Georgian manor house; Duncombe Park - with an important nature reserve, temples, terraced gardens and a walled garden; the York Museum Gardens - amongst the most scenic and popular gardens here, located next to River Ouse; and Dean's Park - close to York Minster, providing a peaceful oasis right in the heart of busy city life. Rich in museums and art galleries, York is full of heritage and is a cultural capital in the north of England. Museums here provide interesting information on the history of York and some of the most notable include the Yorkshire Museum, the Richard III Museum, the Bar Convent Museum, the National Railway Museum (NRM), the York Castle Museum, Micklegate Bar and the Stewart Collection. When it comes to art galleries, look out for the Adze Art Gallery, the City Art Gallery, the Alan Stuttle Art Gallery, the Pyramid Gallery, Studio Art Gallery and the Impressions Gallery. York has a large university, excellent shopping facilities - with more than 2,000 shops, a number of large shopping centres and departments stores in the city centre. Combined with almost 200 restaurants, countless cafés and coffee shops, entertainment complexes, cinemas, historic theatres - including the Grand Opera House, public houses, bars and night clubs, there is always something to do in the expanding metropolis that is York city.